Planned 'March Against Sharia' Rallies Attract Right-Wing Extremists Saturday's nationwide "March Against Sharia," sponsored by a group known for aggressively criticizing Islam, has in recent days become a rallying cause for right-wing extremists. 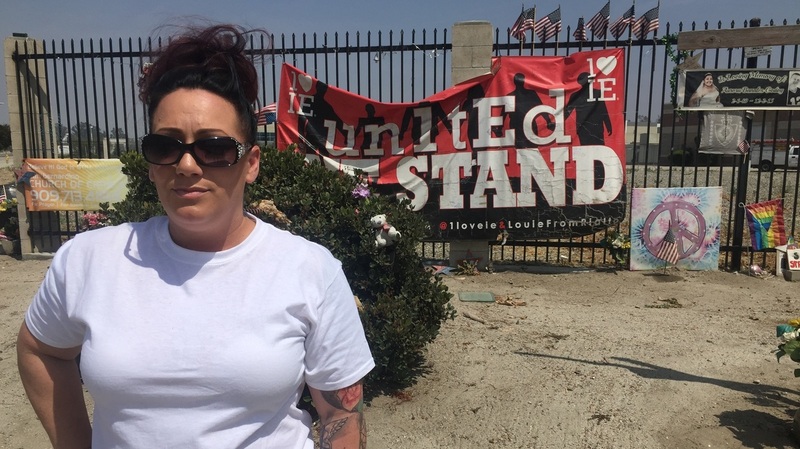 Denise Zamora is the organizer of Saturday's "March Against Sharia" in San Bernardino, Calif., the site of a 2015 mass shooting. The marches, due to be held in at least 19 states, are being coordinated by ACT for America, a conservative grass-roots organization that calls itself "the NRA of national security." The group has a long history of opposing Sharia, which is a legal or philosophical code derived from Islamic scripture and meant to guide the behavior of observant Muslims. ACT for America organizers say an adherence to Sharia among Muslims leads to abuses against women, from discrimination to honor killings. The national coordinator of the marches, Scott Presler, is a 29-year-old Republican operative who says he, as a gay man, was first motivated to fight Muslim extremism after the deadly Orlando, Fla., shooting last June. The target in Orlando was a gay nightclub, and the perpetrator allegedly pledged loyalty to ISIS. To Presler, it highlighted a problem of anti-gay bigotry in orthodox Islam. "This was born on the Internet, from me sending out a Twitter post saying, 'Hey, I would love to do a rally, who wants to help?' " Presler told NPR. The query, he said, prompted responses from conservative activists across the country. "My email has just been pummeled with activity." Among those who answered Presler's call is Denise Zamora. She offered to organize a march in San Bernardino, Calif., at the site of the 2015 mass shooting carried out by a Pakistani-American and his wife. "I wasn't even familiar with anything about Sharia law," she told NPR. "I didn't know much about radical Muslims or jihad. I wasn't educated. So I started learning about everything, and when ACT for America announced they were going to do a nationwide march, I quickly volunteered." Zamora, whose political activism began with her involvement in the Trump presidential campaign, says the San Bernardino rally, like others across the country, will highlight the problem of female genital mutilation. The practice is common in some conservative Muslim societies, but many Islamic scholars insist it is not mandated under Sharia. Presler hopes the marches will attract broad participation. "These are things that all women should support," he said. The movement, however, appears to be in danger of veering in an extremist direction. ACT for America has a militant attitude toward Islam, and comments on Facebook suggest the marches are attracting many far-right sympathizers, including several who decorate their posts with Confederate flags. In Arkansas, a march was organized by Billy Roper, an avowed white supremacist. "We want to send a message to Muslims that they are not welcome in our communities," Roper said in a podcast on Wednesday. "We want to send a message to Muslims that they're not welcome in our state. And ultimately we want to send a message to Muslims that they're not welcome in our nation and, of course, endgame, on our planet." Roper specifically encouraged "white nationalists" to attend the marches and noted they could bring weapons to those rallies where "open carry" gun laws are in effect. Such extremism has alarmed the ACT for America leadership. After his podcast, the group severed ties with Roper and put out a statement that the Arkansas march was canceled "when we became aware that the organizer is associated with white supremacist groups. This is against all of our values." Roper's wife, however, posted screenshots of prior emails between Presler and Roper, including one showing Presler telling Roper, "You are approved and ready to go." Asked about that communication, Presler said only that the Arkansas march was canceled "as soon as the information revealed itself." Militant "anti-fascist" or "antifa" groups, however, have promised to show up at anti-Sharia rallies to confront the marchers, and right-wing paramilitary groups such as the Three Percenters, Proud Boys and Oath Keepers were arranging to provide security at the rallies, setting the stage for violent confrontations. Those organizations have previously clashed with "antifa" groups in Berkeley, Calif., and Portland, Ore., though Oath Keepers President Stewart Rhodes told NPR that his members only engage the counterprotesters when the police fail to keep the two sides separated. "Where the police stand up, we'll stand down," Rhodes said. "But where they stand down, we have to stand up." Rhodes declined to say which marches will be secured by Oath Keeper volunteers, many of whom have law enforcement or military backgrounds, though they are expected at several locations. "We're encouraging our members to go to each and every one of them," Rhodes said. The Oath Keepers website says members promise to support the U.S. Constitution "against all enemies, foreign and domestic" and pledge to disobey any order they consider unconstitutional. The prospect of violent confrontations at the anti-Sharia marches have local law enforcement authorities on edge. In San Bernardino, an "antifa" group has posted signs at the site of the march, urging activists to confront the marchers. A police spokesman says the department will be monitoring both sides for any signs of trouble. Michael Radcliffe contributed to this story.